This section take you through the discoveries in magnetism and electicity through time, in the order they where discovered. With experiments you can do at home to replicate the discoveries. Pieter van Musschenbroek and his assistant, while trying to get sparks using glass with in it water, a wire and a charged glass tube. His assistant held the jar in his left and with the wire in the water and the other end of the wire in the charged tube. When he touch the wire there was a large spark and he felt a in his body. Later they would add a stopper and wire with a ball. This became know as the layden jar, named after the university of Leyden where the experiment was done. There was another person Von Kleist who may have done the experiment first, but Pieter van Musschenbroek account was clear and repeated by other. Pieter van Musschenbroek was also the first to use the term physics. Stephen Grey was a dyer by profession, but had interests in astronomy and natural sciences. His education was mostly self educated. We he retiremented he experimented with static electricity. In one experiment he used a glass tube which he kept the ends closed with cork, to keep the tube clean. He noticed that when he rubbed the glass tube the cork, attracted items. He put a stick into the cork and was able to extend attraction. He began to do experiments to see how far he could extend the effects. This was the beginning of experiments with conduction, the ability to move electrons through materials. 1709 – Glowing discovery – Francis Hauksbee Francis Hauksbee, also known as Francis Hauksbee the elder, experimented with mercury after hearding of the account that the french astronomer Jean Picard in 1675 had observered a faint glow while caring a mecury barometer. He discovered that mercery in a glass cantainer exposed to static electricitity can glow bright enough to read by. This is called electroluminescence. Francis Hauksbee make a modified static electric generator like Otto von Guericke’s, which had mercury in the glass ball with a partial vacuum. When it was spun and a hand placed on it, it gave off light. Otto von Guericke invented the first static electric generator. It was a sulfur ball on a rod that can be hand cranked and rubbed with a object to generate static electricity. He heard crackling and felt the hairs sand on end. Soon other in Europe were copying it and making improvements. Niccolò Cabeo May have been the first to notice that object with the same charged are repelled from each other. He wrote a book on magnetic philosophy (“Philosophia magnetica”). Where he descibe metal filing being attracted to a charged object, but once they touched the charged object they are repelled by it. In 1600 William Gilbert, the queen physician, published a book called De Magnete (Latin for “On the Magnet”) . It became the standard for magnetism and electricity. He developed a tool to detect electric charges (electroscope), which he called a versorium. It consisted of a needle on a pivot. He was also to use the term, in Latin, for electric force. He was also the first to realize that the earth was a giant magnet. In 1748 Jean-Antoine Nollet built an early electroscope, an electrometer comprised of a suspended pith ball that moves in response to the electrostatic attraction and repulsion of a charged body. It was a metal box with isolated wire hung down and a piece of metal foil hanging down. With a special lense they amount of movement of the foil could be measured. In 1752 Benjamin Franlin through a series of experiment realized that electricy was not 2 different things, but one thing with 2 different charges. He called one plus and the other negitive. How he identified them, assign the negitive charge to the side with excess eletrons. That is how a electron beame to be known as having a negitive charge. In the Chinese book “Book of the Devil Valley Master” (鬼谷子) is mentioned a “south pointing device” or compass. It was used at the time for fortune telling1. The first reference to using a magnetized need a magnetized needle happens around around 1088, in the Dream Pool Essays by Shen Kuo. It isn’t until 1119 that the use of a magnetized needle compass was used for navigational purposes in Zhu Yu‘s book Pingzhou Table Talks (萍洲可談). A magnetized needle compass was first mentioned in western literature written about 1180 by Alexander Neckam in De Utensilibus (On Instruments). 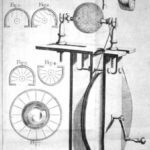 About 1742 Andrew Gordon, a Professor of Natural Philosophy at the University at Erfurt in Germany, invented the Electrostatic Bells. It was the first invention to convert electrical energy into mechanical energy. Benjamin Franklin later used this invention to detect lighting storms and they became more commonly known as “Franklin Bells”.